The entrance to your business is where your customers form their first impression. The top businesses and institutions in the region trust Baltimore Lock & Hardware to service, install, and secure their commercial doors. We provide reliable, fast commercial door service to businesses throughout the Maryland, Washington D.C., northern Virginia, southern Pennsylvania, Baltimore City, and Baltimore County. Every business has unique requirements for security, convenience, and aesthetics. With more than 100 years of combined experience, our highly-trained locksmiths have serviced and installed commercial doors of all types, including hollow metal, wood, aluminum storefront doors, automatic door closers, and doors. Our experience with commercial doors of all types, combined with access to a full range of hardware, allows us to quickly and efficiently service your commercial door on location. 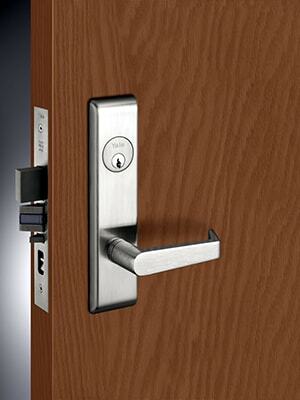 Baltimore Lock & Hardware can install, replace, or repair aluminum storefront doors. 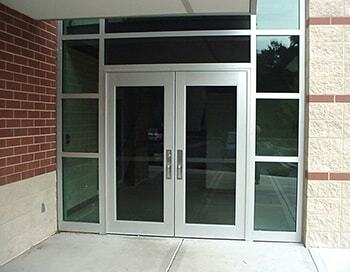 Glass and aluminum storefront doors are some of the most commonly used commercial entranceways, and are available in a variety of styles with a full scope of features. The experts at Baltimore Lock & Hardware can evaluate your storefront and devise the ideal solution to protect your business. We install and adjust door closers and exit devices for all types of businesses. We offer installation and service on a range of both manual door closers, which use torsion springs to regulate the speed of the door, or automatic door closers, which are activated by motion or push button control. Door closers can be surface mounted or concealed within the door, doorframe, or floor.